I know most school years are just ending, but as a year round homeschooler, the planning never really ends. So, if you’re like me you’ve either already purchased some (or all) of your curriculum and you’re in planning mode again. Do your plans include music? Sometimes it seems overwhelming trying to add in all the subjects and then those extras – art and music – especially if they’re not your strong suit. I know all too well, it is so easy to fill your schools days “too full” and the “extras” get pushed aside. Yet, I would encourage you to do what you can to incorporate those “extras” back in to your already too full day – especially music. Music doesn’t have to be a 2-hour a day subject. While other subjects may take more time, music isn’t necessarily one of them. Other than practicing for private lessons, music can take as little as 20 minutes a day! 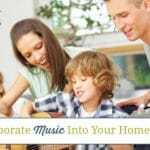 There are some really quick and easy ways to add music to your homeschool day, which will not only build a foundation of music but a love for it too. The easiest way is to bring music in, is to play it during the day. Start off the day with some soft music playing during breakfast and then keep it on while the kids work (if that doesn’t bother them) and even while they play. It is amazing the calmness music will bring to a room. When our kids get over stimulated and need to calm down or unwind, we turn off all the electronics, turn on the music and just play together. It is so peaceful and builds wonderful memories surrounding music. Let them dance and/or move to the music as they listen. It is a great way to get their bodies moving and get them really listening to the music. Is it fast? Slow? Loud? Soft? Bouncy? Flowing? There are so many great ways to experience music through body movement. PLUS…this combines both music and P.E. or gym time and works great on super hot or rainy days! Include it as part of a bigger Unit Study. Adding it in to your history studies is a wonderful way for kids to learn more about the era in which certain music was created. It also helps give more of the “big picture” in which music played such a large role throughout history. 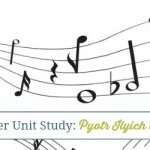 By adding it in to a unit study, I believe it also helps kids relate music to the time period in which it was composed, giving it a more relative connection. Do a simple music study program, such as SQUILT, just two days a week. This program is one that can easily be incorporated in just about 30 minutes twice a week. Mary, has created 4 amazing volumes that cover the major music eras – Baroque, Classical, Romantic and Modern. She also has SQUILT Christmas Carols and samples to help get you started! See…it’s not as hard as you might think! And the benefits of a music education are worth making the extra time. How will you add music in to your homeschool day? Yes…check it out!! It is great for all ages! Thanks for stopping by. Music is so important! Two of my three children play musical instruments. My middle child has no interest in playing an instrument. She is an athlete but she sings. 🙂 Music was also the key when one of my children stopped struggling in school and became a A student. How wonderful that you have children who play! It’s amazing what music can really do! Thanks for stopping by. Good post. Music can be overlooked. I was just checking out Mary’s SQUILT program. It sounds great, easy, and even peaceful and relaxing. We LOVE SQUILT!! I can’t wait to use it regularly this year in our school!! We have only done them sporadically for special occasions. Thanks for stopping by! We are adding a few extras to next year and I have been worried that its going to be too much. Thanks for the encouragement!! Glad I could help! Hope it goes well! 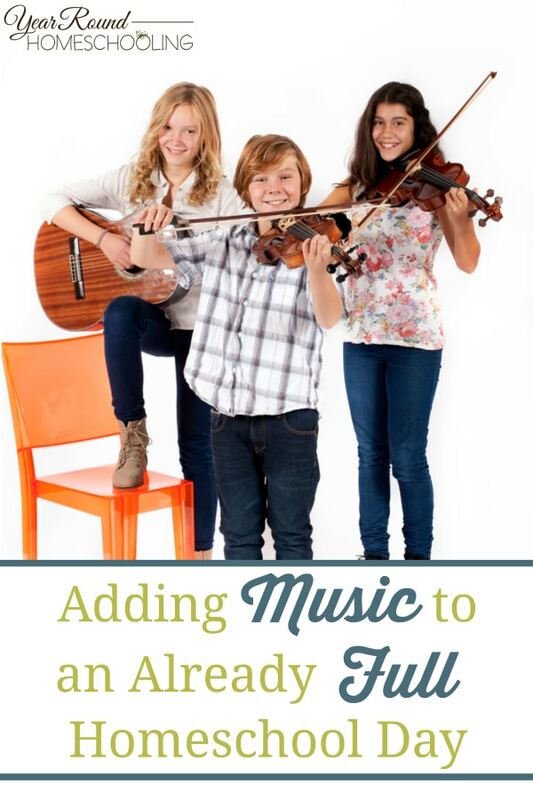 Thanks for making such a great point about making time for music in homeschool! Also the point about linking music to part of a larger unit study is spot on — there’s a fantastic book called Sound Ways of Knowing that has some great examples of interdisciplinary projects that include music. All that being said, we’ve noticed that a lot of resources for homeschool music appreciation focus on classical music composers and facts about reading music. Do you think there is interest for additional music from around the world, more current composers, or different types of activities that involve children actively engaging in music such as composing or other activities? We’re in the process of creating resources for http://www.raisingcreativechildren.net and want to focus on what would be most helpful to people. Thanks for stopping by. I think music around the world and current composers would be very helpful. And any activities that get kids interested in music are great.